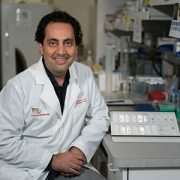 Dr. Nazarian’s lab at Children’s is part of the CBTTC, which has helped in launching CAVATICA. Pictured (from left to right): Dr. Nazarian, Sabine Mueller, M.D., Ph.D. (PNOC Trial Director), Rishi Lulla, M.D. (CBTTC Executive Director), Francis Collins, M.D., Ph.D., (NIH Director), and Adam Resnick, PHD (CBTTC Scientific Director). 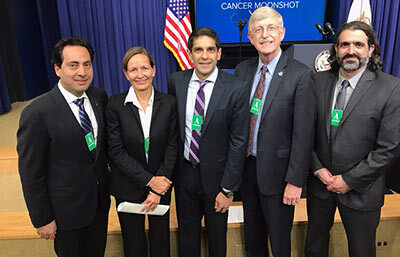 Earlier this week, The White House released the Cancer Moonshot report, which calls upon the public and private sectors to transform cancer research and care. 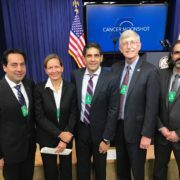 Children’s National’s Javad Nazarian, Ph.D., M.S.C., joined peers from prestigious children’s hospitals from around the world at the news conference. 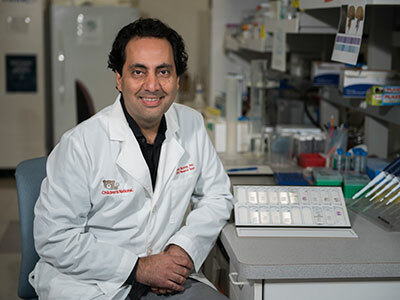 Dr. Nazarian is a key player in the initiative, as his lab is part of the Children’s Brain Tumor Tissue Consortium (CBTTC) and is answering the call to action. The CBTTC and the Pacific Pediatric Neuro-Oncology Consortium, in partnership with Seven Bridges, announced the launch of CAVATICA, a data analysis platform that will help researchers to collaboratively access and share data about pediatric cancers, congenital disorders and rare diseases such as epilepsy and autism. More data will be connected than ever before—CAVATICA will interoperate with the Genomic Data Commons and other NIH data repositories. “It’s an exciting time for research,” says Dr. Nazarian.